Cardinal Newman Lecture Raises the Question: What Is College For? Students may jokingly ask themselves the question, “What’s the point?” in regards to their college education in the last few hours before a final exam, but Columbia University professor Dr. Andrew Delbanco gave serious thought to his answer of this question at the fifth annual Cardinal Newman Lecture on Sept. 9. Delbanco, a local who attended the Fieldston School and learned to drive from an MC professor, has written many works, the most famous and pertinent to his lecture being College: What it Was, Is, and Should Be, which he wrote in 2012. The next image that Delbanco discussed was a cover of Boston Magazine from 2012 that featured a young man in his pajamas sitting in front of his laptop with a Harvard mug beside it. “This image implies that class is on his schedule, and it is a rather positive image of the college of the future,” Delbanco said. Delbanco suggested that from online classes to MOOCS to blended learning opportunities, the college of the future “is coming. This could represent a solution to the increasing costs of college for some” Delbanco said. He then dissected the picture in a similar way to the first image, suggesting that because the young man is on the computer, his experience of college has become one that is done in the same forum that he shops, seeks entertainment, and interacts with his peers via social media, making college learning just another item on his online to do list. Looking at this image, “the idea of human to human interaction is at risk here,” Delbanco said. “I am here to talk about not the future or the present, but about the past. There are some elements of this (past) that we ought to come to terms with,” Delbanco said. Delbanco then went on to quote Thomas Jefferson upon his proudest achievement, not being the President of the United States, but rather, on founding the University of Virginia. “You cannot have a democracy without an educated citizenship,” Jefferson said. He then continued to tell the “story of relentless expansion” that is the American story, including the Morell Land Grant that was passed to create the land-grant colleges, along with the rise of the private institutions. He discussed the GI Bill as it allowed for veterans to get as well as the first public university systems in California with the purpose of allowing “every high school graduate to go to college,” Delbanco said. Delbanco then explained how the expansion of the American college has made it so that half of first generation citizens are typically unable to get into the classes they need and that public universities are now basically private ones. 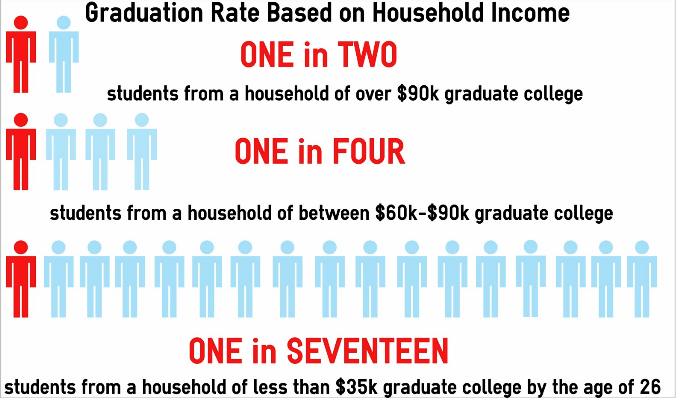 Delbanco then revealed some startling statistics about the relationship between chances of attending college and the household income that a person grows up with. Delbanco explained that on that masthead, Melville asked himself the questions, “How can I make meaning? Who am I?” and in that vein, “University should be a place of contemplation,” Delbanco said. Delbanco gave the example of having two students in a class with highly different backgrounds reading the same text. “A paratrooper veteran from Iraq is going to have a much different experience reading the Iliad than another student who has never come close to knowing war.” Without that personal connection in the classroom, these students would never learn each other’s readings of the same epic.